Power-drop top bead assist roller helps loosen stubborn beads for tyre-tool clearance and also holds top beads in place during installation of tough sidewall tyres. This easy-to-use roller is a pneumatically operated tool that provides incredible—yet safe—pressure against the edge of a tyre. This pressure helps loosen a stuck or stubborn tyre bead. It also holds beads in place when installing a new tyre. 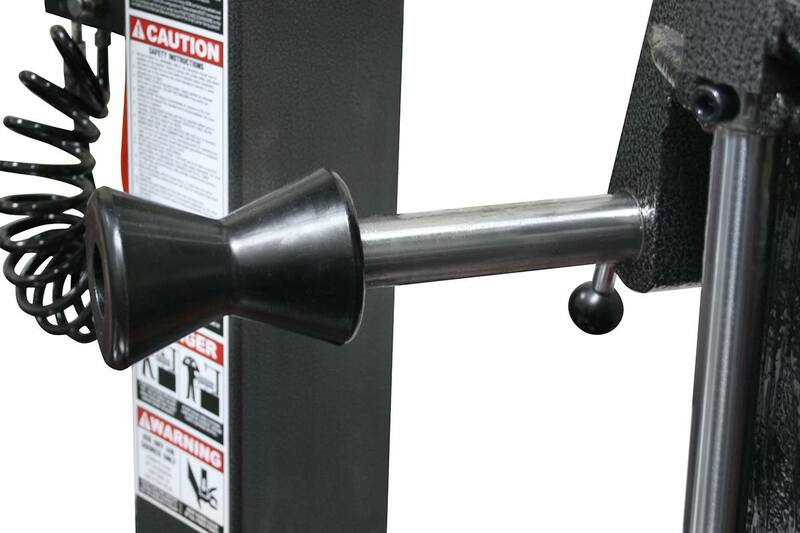 Lift and lower the roller with the flip of a switch at any time during tyre changing operations. By not requiring electricity to power the bead roller, we control the long-term costs of owning a tyre changer and eliminate electrical components that might require extra service over time. The air-powered roller puts extraordinary force against the tyre, but its hourglass design adapts perfectly to every tyre shape. The rubber is non-marring against expensive tyres, and the tip is intelligently designed, so it rolls with the movement of the tyre. The bead roller is easy to lock in place and just as easy to lift out of the way. If changing like sets of tyres, its position can be preserved for faster turnover. If you choose a tyre changer with this feature, know you’re getting one of the best features this industry has to offer. At Ranger Products, we're perpetually adding new products worthy of the Ranger brand and improving on existing designs. Ranger is truly your single-source supplier for reliable garage equipment. Our staggering selection of tyre changing equipment, wheel balancing equipment, general wheel service equipment and tyre equipment makes it easy to find what you need, all in one place. Don’t waste your time with the other guys—get it done right the first time with Ranger.